Marvel(LOS ANGELES) — A new, minute-and-a-half-long teaser for Marvel Studios’ Black Panther, made its debut Monday night during the 2018 National Championship college football game. Chadwick Boseman returns as T’Challa, the young king of the reclusive, technologically advanced African nation of Wakanda, who took up the mantle of its hero, Black Panther, when his father was killed during the events of Captain America: Civil War. The new preview shows him returning to his island for the first time following the events of that film. “The Black Panther lives!” exclaims Danai Gurira; the Walking Dead veteran plays Okoye, one of his loyal bodyguards. 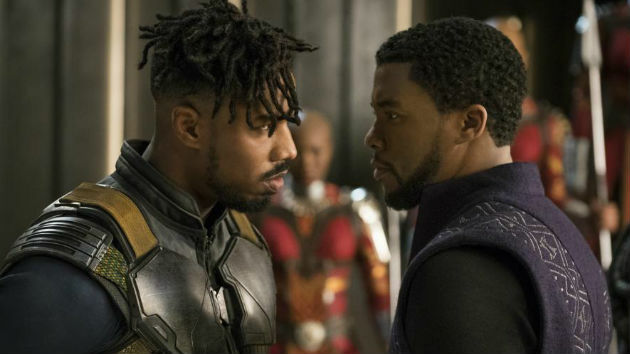 Kilmonger and his men attempt to overthrow the young king. “War is coming,” warns Forest Whitaker’s Zuri, T’Challa’s loyal advisor. “Let them come,” T’Challa responds. The clip also shows a peek of Angela Bassett as his stepmother Ramonda, as well as Letitia Wright as T’Challa’s tech genius sister Shuri. The spot also advertised that tickets are official now on sale for the film, which was directed by Creed‘s Ryan Coogler, and which opens February 16.